An old mining town now famous for its winter sports and for hosting the 2013 FIS Alpine World Ski Championships, the slopes at Schladming consist of an extensive loosely connected circuit of mainly pleasant cruisy runs. The lifts on the Planai have lifts from the outskirts of Schladming and are served by a ski bus, although they are walkable from the station. Despite being low-lying the resorts has mostly north-facing slopes with good grooming and snow-making facilities. Overall the resort has reasonable facilities for all but the most demanding and hard-partying skiers and snowboarders, and makes a good choice for a family break. Schladming is quite a hike from Innsbruck or Vienna, but there are fast direct trains from Salzburg that will get you here in less than two hours (or change at Bischofshofen). Did you ski Schladming or snowboard in Schladming? What did you think? Have you taken the train to Schladming? 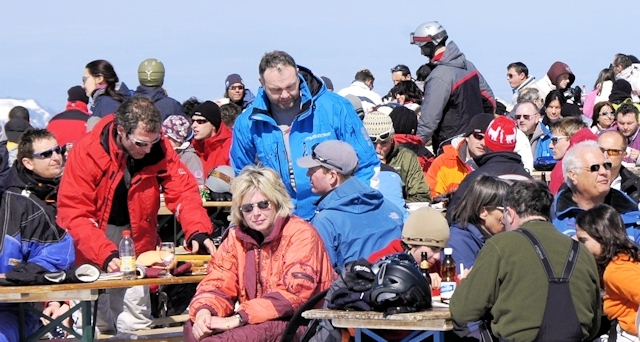 Do you have any tips on accommodation in Schladming or the apres ski? Is there anywhere else you have taken the train to ski? if so, please contact us and share you experiences using the contact link at the foot of the page.